Shalom Online Synagogue and JU-tv will offer Tu Bishvat celebrations bringing to light Tikkun Olam to repair the world and preserve the planet. We are reminded to plant fruit for future generations. The week beginning February 6, Sim Shalom Online Synagogue and JU-tV will offer Tu BiShvat celebrations planting the seeds of Tikkun Olam to repair the world and preserve the planet. The offerings will intertwine spiritual and environmental rebirth and sustainability. Celebrations, which will be offered all week with live streams on Facebook, will culminate on Friday, February 10th with a Tu Bishvat Seder at 7:00pm. Followers around the globe can partake in the free interactive events simply by clicking on Sim Shalom's Facebook page and website. Programming by the new JU-tV, an initiative of the Union of Jewish Universalist Communities (http://www.ujuc.org) will include readings and music steeped in Jewish history and the responsibility of protecting our earth following the themes of Music Monday, How to Tuesdays, Wisdom Wednesdays and Ask the Rabbi Thursdays. 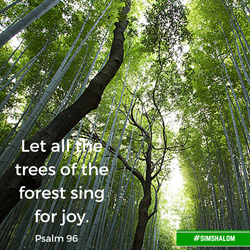 According to Sim Shalom Founder, Rabbi Steven Blane "Although Tu BiShvat is considered a relatively minor holiday in the Jewish calendar we are hoping to promote a significant universal message about preserving nature and the trees which helps to sustain us. We are reminded to plant fruit for future generations." Sim Shalom's weekly Meatless Monday posts, which supports its partnership with the international campaign to abstain from eating meat once a week for personal health and the health of the planet, will feature traditional tree fruits that symbolize rebirth such as figs, pomegranates and dates. In addition to beauty and a haven for creatures in the landscape, trees are vital to helping reduce climate change. They absorb carbon dioxide by storing the harmful pollutant CO2, and release oxygen purifying the air the world breathes. Trees vegetation help to reduce erosion near water ways, the canopy helps to conserve energy. Nature and Judaism will be nourished. Individuals are encouraged to plant a tree. Rabbi Blane is also the founder and director of the Jewish Spiritual Leader's Institute, the online professional rabbinical program.